Sawyer County is located in Northwest Wisconsin between Spooner and Phillips in the north western part of the state with the Chippewa River winding through it. Sawyer is known for its lakes, fishing, hunting, woods, skiing, golfing, boating, canoeing, kayaking, biking, hiking, snowmobiling, ATVing, horseback riding which also has Flambeau river State Forest, Tuscobia State Trail, Sand Lake, Lac Courte Oreilles Lake, Grindstone Lake, Round Lake Moose Lake, Kissick Swamp State Wildlife Management Area, Nelson Lake plus a couple communities including; Edgewater, Weirgor, Stone Lake, Winter, Ojibwa and Hayward. It's surrounded by 7 other Counties; Bayfield, Ashland, Price, Rusk, Barron, Washburn and Douglas. On this site you can search for Waterfront Property, Creek Frontage, Stream Frontage, Channel Frontage, Streamfront Homes, Creekfront Cottages, Creekfront Cabins, Streamfront Log Homes, Channelfront Cabins, Waterfront Houses, Boat Docks, Private Piers, Trout Streams, Creekfront, Channel Homes, Creek Homes, Stream Homes and more... located in this county, listed by a real estate agents. 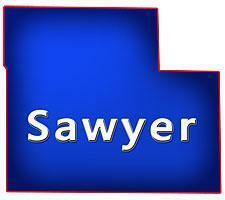 Sawyer County, Wisconsin GIS MAP Information!